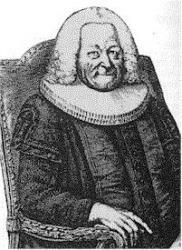 Neumeister, Erdmann, son of Johann Neumeister, schoolmaster, organist, &c, at Uechteritz, near Weissenfels, was born at Uechteritz, May 12, 1671. He entered the University of Leipzig in 1689, graduated M.A. in 1695, and was then for some time University lecturer. In June 1697 he was appointed assistant pastor at Bibra, and in 1698 pastor there, and assistant superintendent of the Eckartsberg district. He was then, in 1704, called by Duke Johann Georg, to Weissenfels as tutor to his only daughter, and assistant court preacher, and shortly afterwards court preacher. After the death of this princess, Neumeister was invited by the Duke's sister (she had married Count Erdmann II. von Promnitz) to Sorau, where on New Year's Day, 1706, he entered on the offices of senior court-preacher, consistorialrath, and superintendent. Finally, in 1715, he accepted the appointment of Pastor of St. James's Church at Hamburg, entering on his duties there Sept. 29, 1715. He died at Hamburg, Aug. 18 (not 28), 1756 (Bode, p. 120; Allgemeine Deutsche Biographie. xxiii. 543, &c). 1. DerZugang zum Gnadenstuhle Jesu Christo. This was a devotional manual of preparation for Holy Communion, with interspersed hymns. The first edition appeared at Weissenfels in 1705, the 2nd 1707, 3rd 1712, 4th 1715. The earliest edition of which precise details are available is the 5th edition 1717, from which Wetzel, ii. 231, quotes the first lines of all the 77 hymns (the page references to the earlier eds. given by Fischer appear to be conjectural); and the earliest ed. available for collation was the 7th edition, 1724 [Göttingen University Library]. In the later editions many hymns are repeated from his other works. 2. Fünffache Kirchen-Andachten, Leipzig 1716 [Wernigerode Library], a collected edition of his Cantatas (Wernigerode Library has the 1704 ed. of his Geistliche Cantaten), and similar productions. A second set (Fortgesetzte) appeared at Hamburg in 1726 [Hamburg Town Library]; and a third set (Dritter Theil) at Hamburg in 1752 [Hamburg Town Library]. 3. Evangelischer Nachklang, Hamburg, 1718 [Hamburg Town Library], with 86 hymns on the Gospels for Sundays and Festivals, originally written to form conclusions to his sermons. A second set of 86 appeared as the Anderer Theil at Hamburg, 1729 [Hamburg Town Library]. i. Gott verlasst die Seinen nioht, Ei so fahret hin ihr Sorgen. Cross and Consolation. In his Evangelical Nachklang, 1718, No. 71, p. 149, in 5 stanzas of 8 lines, appointed for the 25th Sunday after Trinity, in Burg's Gesang-Buch, Breslau, 1746, it appears in two forms. No. 127 is the original with alterations, and arranged in 11 stanzas of 4 lines, with the refrain "Gott verlässt die Seinen nicht." No. 128 is a form in 3 stanzas of 6 lines, rewritten to the melody, "Jesus meine Zuversicht", and beginning with stanza iii. line 5, of the original, viz. "Gott verlässt die Seinen nicht, Nach dem Seufzen, nach dem Weinen." Stellt euch mit den Weisen ein. 1. Jesus! great and wondrous star. A good and full translation by E. Cronenwett, as No. 52 in the Ohio Lutheran Hymnal, 1880. 1. This man sinners doth receive. In full by Dr. H. Mills, in his Horae Germanicae, 1845 (1856, p. 73). His translations of stanzas i., ii., iv., v. are included in the American Lutheran General Synod's Collection, 1850-52, No. 844. 2. Jesus sinners doth receive! Spread the word of consolation. A good translation of stanzas i., iii.—v., by A. T. Russell, as No. 47 in the Dalston Hospital Hymn Book, 1848, repeated in his own Psalms & Hymns, 1851. 3. Jesus is the sinner's Friend. A good and full translation by Miss Dunn in her Hymns from the German, 1857, p. 82. Her translations of stanzas i., ii., iv. are No. 46 in Dr. Pagenstecher's Collection, 1864. 1858, p. 23. Repeated in full in L. Rehfuess's Church at Sea, 1868, p. 50, and, abridged, in the English Presbyterian Psalms & Hymns, 1867, and Flett's Collection, Paisley, 1871. In Dr. W. F. Stevenson's Hymns for Church & Home, 1873, stanzas i., v., vi., vii. are included, altered, and beginning "Jesus sinners will receive; Say this word of grace to all;" and this form is also in the Baptist Hymnal, 1879. (l) "My Jesus the sinner receives." By Miss Warner, 1869, p. 51. (2) "Jesus sinners doth receive! Tell to all." By R. Massie in the Day of Rest, 1811. The hymn "Jesus sinners will receive, When they fall," by E. Cronenwett, in 5 stanzas, in the Ohio Lutheran Hymnal, 1880, is marked as a translation of Neumeister. It follows Neumeister in metre, but seems rather a paraphrase of the hymn "Jesus nimmt die Sünder an, Drum so will ich nicht verzagen." This hymn is by Ludwig Heinrich Schlosser [b. Sept. 1, 1663, at Darmstadt; d. Aug. 18,1723, as pastor at Frankfurt am Main], and appeared in the Appendix to the Frankfurt ed., 1693, of Crüger's Praxis, and in his own Stilles Lob Gottes in dern geistlichen Zion, Frankfurt a. M , 1724 (see Wetzel, iv. 433; Kambach's Anthologie, vi p. xi., &c). In Burg's Gesang-Buch, Breslau, 1746, the Neumeister hymn is given as No. 1593 and marked as by G. G. Hofmann, and the Schlosser hymn as No. 1592 and marked as by Neumeister. Hence perhaps the confusion. Hymns not in English common use:--. iv. Bleib, Jesu, bleib bei mir. For the Dying. In his Evangelical Nachklang, 171S, No. 31, p. 64, in 7 st., entitled "For the Second Day of Easter." In the Berlin Geistliche Lieder, ed. 1863, No. 1434. Translated as "Jesus, near me still abide." By Miss Dunn, 1857, p. 117.
v, Herr Jesu Christ, mein höchstes Gut. Love to Christ. One of his best and most popular hymns, apparently written for use at the Sunday celebration of Holy Communion in the castle at Weissenfels. It seems to have appeared in his Zugang, 1705 (Wetzel, ii. 232, cites it as in the 5th edition 1717. In the 8th ed. 1724, p. 17, entitled “Hymn of Consolation from Ps. lxxiii. 23-28 ), and is included in the Halle Stadt Gesang-Buch,1711, No. 524 in 6 st. In Freylinghausen, 1714, it begins "Herr Jesu Christ, mein Fleisch und Blut." In Porst's Gesang-Buch,ed. 1855, No. 546. The translations are (1) "All my desires are fix'd on Thee" (st. iii.). By P. H. Molther as pt. ot No. 401 in the Moravian Hymn Book 1801 (1886, No. 448). (2) "Lord Jesus Christ, my spirit's health." By Dr. H. Mills, 1845 (1856, p. 115). vi. Herr Jesu, meines Lebens Heil. Evening. Apparently in his Zugang, 1705 (Wetzel, ii. 232, as in ed. 1717. In ed. 1724, p. 284 in 10 st), and included in the Halle Stadt Gesang-Buch, 1711, No. 426. In Burg's Gesang-Buch, Breslau, 1746, No. 1844. Translated as (1) "Now I'll lie down and sleep in Thee"(st. vi. ), as pt. of No. 750 in the Moravian Hymn Book, 1789 (1849, No. 1137). (2) "Lord Jesu! Thou my life's true health." By H. J. Buckoll, 1842, p. 92.
vii. Ich bin bei allem Kummer stille. Trust in God. Included in the 5th ed. 1717 of his Zugang (Wetzel, ii. 232), and in the ed. 1724, p. 594, in 6 stanzas, founded on Ps. lxxvii. 11. In the Berlin Geistliche Lieder, ed. 1863, No. 911. It has been translated into English through the recast by J. S. Diterich "Herr, mache meine Seele stille," which is No. 169, in 7 stanzas, in the Berlin Gesang-Buch,1765 (Berlin Gesang-Buch, 1829, No. 599). Translated as "Lord, make my spirit still." By Miss Warner, 1869, p. 26.
viii. Ich weiss dass mein Erlöser lebet. For the Dying. In his Evangelical Nachklang, 1718, No. 32, in 5 st., entitled "On the Third Day of Easter." In Bunsen's Allgemeine Gesang-Buch, 1846, No. 437, in 4 stanzas. Translated as "I know that my Redeemer liveth, And as He lives." A good translation from Bunsen in Reid's Praise Book, 1872.
ix. Ob Menschen klug und weise sein. Spiritual Wisdom. In his Evangelical Nachklang, 1718, No. 12, p. 24, in 6 stanzas, for the 1st Sunday after Epiphany. In the Berlin Geistliche Lieder, ed. 1863. Translated as “Here many wise and prudent grow." By Dr. H. Mills, 1845 (1856, p. 109). x. So ist die Woche nun geschlossen. Saturday Evening. Apparently in his Zugang, 1705 (Wetzel, ii. 233, cites it as in ed. 1717. In the ed. 1724, p. 552, in 9 st. entitled "Hymn for the close of the Week"). In the Berlin Geistliche Lieder, ed. 1863. Translated as “Thou, Lord, Thy love art still bestowing." By H. J. Buckoll, 1842.